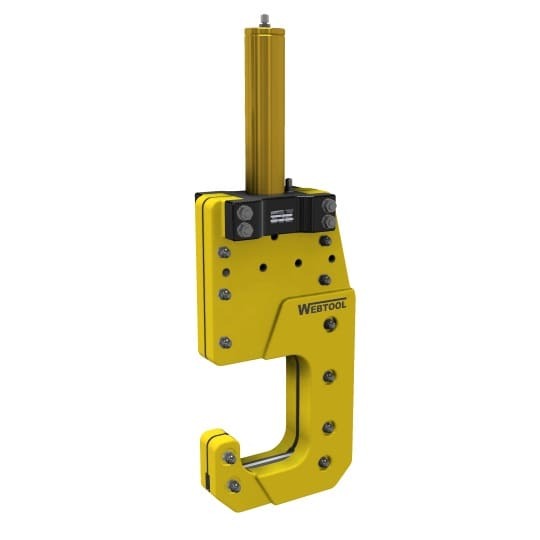 SL165 Softline Cutter - Lightweight, open sided subsea softline cutting tool for up to 165mm diameter. The SL165 – Softline Cutter is a lightweight cutting tool. However, it can also act as a heavy duty Softline Cutter. It is designed for subsea deployment in severe working conditions. The open-sided design allows for easy positioning on the line by ROV or diver and simple operation. Corrosion resistant and durable coated aluminium and stainless steel construction. Genuine Webtool™ blades and anvils give the optimum cutting performance and ensure that maintenance is kept to a minimum. Open-sided design and no-moving anvil makes deployment simple and reduces the number of hydraulic hoses required. Mounting holes in the body of the cutter allows for the fitting of standard handles (contact us for details) or bespoke mounting brackets. Serviceability and Support – Spare parts including blades, anvils and seals kits are available for this softline cutter. Contact our friendly team for technical questions and support, they would be happy to help! Capable of cutting softline cables, fibre ropes and lifting slings including aramids, Dyneema®, Spectra® and Twin-Path® up to 165mm (6.5”) diameter. Hydraulic Supply – 690 bar (10,000 psi) input pressure. Swept Volume (Cut Stroke) – 0.51 litres. Swept Volume (Return Stroke) – 0.35 litres. 2 hydraulic ports (blade up, blade down). Cutter weight in air – 54kg. Cutter weight in water – 36.5kg. For more information about this softline cutter, or any of the other Webtool ROV tools we manufacture please contact us here. You can also email us at info@allspeeds.co.uk. If you would like to contact us by telephone our number is 01254 615100 and our friendly team would be very happy to help!